I have eventually managed to get round to update our catch report, it’s a shortened version as its been so long. The first half season of 2012 has been a hard year, very cold weather and crap conditions right up to May, however we did get out a few pb´s and some descent fishing in. Fishing in Extremadura during June, July and August is basically a no-no, temperatures average 40 deg and it is unbearable to be on the bank during the day, however we did get some time on the bank, mainly setting up at 9pm (34 deg) and packing up around 10 the next morning. 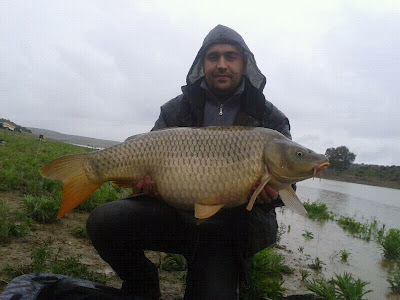 Antonio´s new PB of 17.5lb taken on his first ever Carp fishing session with Craig on the Orellana, unfortunately Julie, his friend, lost a fish … The lads are just a couple from the village fishing club who Craig has been giving fishing lessons to. Late August and Chino was on holiday so I had along weekend on the Orellana with him and his family. Plenty of friends and family turned up so we let them have a go on our rods.. We had around 30 runs- 3 x30s, biggest being 37lb 8oz, plenty of upper 20s and unfortunately I lost a ´lump´on an underwater craypot. 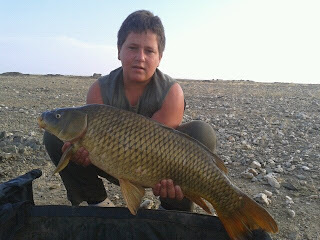 Never the less, we had a great laugh, and the visitors landed their first ever carp. Even the farm hand had his lunch with us and had a go. Bob joined Ken for 4 days and had plenty offish to 36lb 8 oz. Not bad as he didnt recast his rods throughout the night... Ken again had a pb common, the last 2 trips he had a pb common at over 34lb and a mirror at nearly 37lb. One of the 2 competitions entered on Orellana in April -May. We managed 2nd out of 22 pairs with a 37lb Common to Stu´s rods., it was hard work with cold weather and storms, plus a huge hatch that went on for the 3 days.. Thats fishing!! One social event went horribly wrong, but a great time was had by all.I had just fished a 3 day competition with Gary from Alicante in which only 5 fish had been banked out of over 30 pairs of anglers. Fish were all over the place, crashing like mad but weren’t interested. We worked hard at it, trying everything until one of my rods eventually screamed off -10 minutes after the whistle had gone, either way it wouldn’t of counted as I lost it, I had gone down so fine (18lb flouro hooklength)it cleaned me off –remember these are strong wild carp here. .
Next day I went for an overnighter as we had permission to fish the night in an area we don’t normally night fish, we are restricted to night fishing only a small area of the lake I got hit by a huge storm and the night was uneventful other than the crazy weather.,. Moving on to our allocated pegs Stu and I drew a bad swim, unfishable due to the weed. The weather was mad, storms and rain, 4x4´s getting stuck and Spanish makeshift bivvys getting blown into the fields behind. Nevertheless, we had a few laughs and Chino and Fernando caught a few fish. 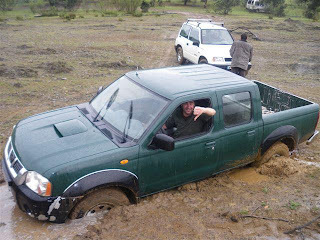 The Nissan was called for to get this one out, the Suzuki just bounced around on the spot with tyres spinning, not enough weight or power..
A typical Spanish ´bivvy´ very social events normally, all the family, pets and usually a traditional ´Paella´cooked for everyone.. Unfortunately just after setting it up, a storm blew it into an ajoining field. After the mad weekend with friends, where Stu and I blanked, we were struggling on our allocated pegs, as we were fishing over heavy weed and fish were showing further up. I spoke to Jake, who was alone on Brava and he suggest i should have our first session together and fish next to him on Brava. I decided to stay on Orellana but move to the area a little further down where Fernando and Chino had runs from. After moving, within hours the fish start spawning, so the next day, I rang Jake and asked if it was still ok to go fish with him. So I headed to Brava to set up in my 5th peg of the week, I was knackered and determined to enjoy it and relax with a few beers. I did big style…, I didn’t take it too serious, which cost me several fish, as I recast rods after runs whilst making new (different) rigs up. I would normally change things first. It was a good session, plenty of runs, piss taking and we both managed to land a several 30lb plus fish…. I didn’t like the mice there though….., they must have grown huge since my last visit, they kept on nicking food n stuff, even my coffee jar… Was a great chill out – thx Jake..
Brothers Bob and James visited us from Bonnie wee Scotland for a bit of pleasure fishing. Both being very competent fly and boat anglers fancied something a little different. They had a little bad luck with the abnormall weather we have had this year, but had plenty Barbel and Carp on tip and waggler tactics. A bite a chuck, first Barbel for the lads, and a PB double. These Carp are small, but scrap like hell on light tackle. Marty and Peter drew the short straw on their visit, gale force winds. It never stopped until the last day or so, and to be quite honest, by that time we were all worn out and beaten.